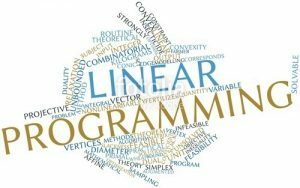 Linear Programming is used in power market economics and operations to minimize the cost of generator providers while considering constraints such as minimum up-time, bands, min/max mw, capability curves, etc. My simple project example considers the market economics of two generators using linear programming to minimize costs with respect to constraints. The objective of the problem is to minimize cost of combined bids of both generators. The objective function is the sum of the unit price of the MW multiplied by the quantity to be bid added to the other bid ranges and their respective products. Note: In the MATLAB portion of the model, the x4 and x8 variables are set equal to 0 since it is not in the problem definition to minimize these. Constraint (1) is formulated on the definition that the Generator G1 bids from the given three quantities 20MW, 30MW, or 15 MW. Constraint (2) is formulated on the definition that Generator G2 bids from the given three quantities 15MW, 40MW, or 25MW. The minimized cost under the optimal model to supply 100 MW load is $2,330.00. The cost to supply load by generator G1 will be $1150 from G2, $1180.